JB begins his look back at the 1975-76 audio adventures of Batman and Robin from Power Records with a review of the classic Joker story, “Stacked Cards”, written by the great Neal Adams who also did the art for the Book & Record Set. Unlike JB, I got the Staked Cards book & record set before I got the album with the story. 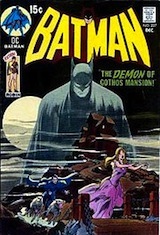 In fact, it was one of the first few Batman items I got as a kid. I don't remember if this was my first exposure to Neal Adams's artwork or if I got Staked Cards after the Ra's Al Ghul treasury. Don't laugh, but these Power Records helped me learn to read, too. Plus, I was the only kid in kindergarten who knew what a lobotomy was. That knowledge came in handy later, when I got the Best of DC treasury and read The Demon Within. I thought the Captain of the Swim Team at Arkham was a little throwback to the TV show. Remember that time the Joker played softball as part of Warden Crighton's rehabilitation program? I love all the music on Staked Cards, too. Obviously, the introductory music is awesome, but that number playing while Batman and Robin are driving the Batmobile is pretty groovy, too. Finally, you talked about how bad Robin comes off in the story, but Batman isn't a lot better. After he gets Commissioner Gordon's call, he waits around and really doesn't do anything. Couldn't he have remembered the warehouse at that point? That would have saved Mr. Waterbury's guard's life. To this day, my mom remembers, "He was lying there with a ghoulish grin on his face." Oh, and how did Mr. Waterbury know to show up at the warehouse? I'd like to use this time to give a shout-out to my mom. She was glad that I got interested in Batman when I was five because she said I was very eager to learn to read so I could follow Batman's adventures in the comics.